Saurav Ganguly lived up to his own prediction by leading India to a comprehensive seven-wicket victory over Sri Lanka here today to square the three-match series 1-1. Indian captain Saurav Ganguly hits a boundary on the fourth day of the second cricket Test in Asgiriya Cricket Stadium in Kandy on Saturday. 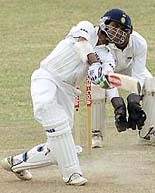 Ganguly hit an unbeaten 98 as India won the second Test by seven wickets and squared the three-match series. Skipper Saurav Ganguly was very happy with the discipline showed by India in the second cricket Test against Sri Lanka which ended today and hoped the team would come up with a similar performance in the decider in Colombo. England prevented Australia leg-spinner Shane Warne taking his 400th Test wicket but were still in trouble on 259 for five at tea on the third day of the fifth Test here at The Oval today. Venus Williams had to beat Belgium’s Justine Henin and then back up to defeat Jennifer Capriati here yesterday in a $565,000 hardcourt tournament for the right to meet Lindsay Davenport in the all-American final. Lightning-quick Liverpool won their fifth piece of silverware inside six months here yesterday with a pacy performance to defeat German giants Bayern Munich 3-2 in the European Super Cup. Morocco’s Brahim Boulami smashed the world record in the 3,000 metres steeplechase on a night of outstanding performances at the Memorial Van Damme Golden League event. American Marion Jones (right) edges ahead of Ukraine’s Zhanna Pintusevich -Block to take first place in the women’s 100 meter at the Memorial Van Damme athletics event at Brussels King Baudouin Stadium on Friday. The Arjuna Awards function, scheduled to be held here on August 29, has been postponed as President K. R. Narayanan is indisposed, official sources said today. Amritsar women pipped Rest of Punjab 76-61 to begin their campaign in style on the first day of the 10th Punjab State Basketball League Championship at the indoor basketball hall of Guru Nanak Stadium here today. India’s medal hunt in the fourth Commonwealth shooting championships in Bisley, England, continued today with two gold, one silver and one bronze medals but Abhinav Bindra disappointed in the World Cup finals in Munich. Bowling, a medal event in the Asian and Commonwealth Games, and which is also on the verge of getting into the Olympic fold, is poised for a quantum growth in Haryana as the state government has slashed the entertainment tax on it from a steep 125 per cent to just 20 per cent. This was disclosed by president of the Bowling Federation of India Devender Singh. The England cricket team will play three Test matches at Mohali, Ahmedabad and Bangalore during their tour of India from November 18 to February 3, 2002, according to BCCI president A.C. Muthiah. England team will play five one-dayers against India at Kolkata, Chennai, Mumbai, Delhi and Kanpur from January 18, 2002 to February three next. K.V. High Grounds Chandigarh won the K.V.S. Regional Under 19 Cricket Championship while K.V. R.C.F. Hussainpur, Kapurthala, were runners-up. For winners Amrinder Singh made a hurricane 57 runs with 4 sixs and 6 fours, while Harpreet scored 35 runs. Belying expectations of a nail-biting finish, Vivek Bhandari of Delhi ended his four-year title drought by winning easily the Rs 10-lakh Hero Honda Open, the third of the Hero Honda Golf Tour, at the KGA Golf Course here today. Maharashtra’s Karthiki Bhat scored a grand double claiming both the girls under-18 and under-14 titles while West Bengal’s Rupesh Roy lifted the title in the under-14 boy’s section in the Adidas-AITA Junior Ranking Tournament today. It was a good day for the Panchkula shuttlers who made it to eight finals on the penultimate day of the Haryana State Junior Badminton Championships at Karnal. As per fax message reaching here, Akshit Mahajan reached the under 10 final and will meet Tapan of Sonepat. Rohit Verma of Sirsa defeated Dev Saini to clinch the title in the boys’ section on the second day of the state-level table tennis tournament. The Public Health and Civil Aviation Minister, Raja Narinder Singh, today distributed prizes at the annual three-day sports fete held at Ghaniwal village falling in Nabha sub division here. About 162 teams participated in various sports event. After the humiliating 10-wicket defeat in the first Test at Galle, Ganguly had said India would bounce back in the series the way they did against Australia a few months ago. And the captain himself showed how to effect that comeback, as he left behind his recent horrid form to remain unbeaten on 98 invaluable runs, his best score in the last two years. A winning boundary by Mohammad Kaif denied Ganguly a well-deserved century as India got past the target at the stroke of tea on the fourth day of the match today but the captain was certainly not complaining. Rahul Dravid had earlier laid the foundation for the win weathering through the storm in the initial part of the innings and contributing a handsome 75. Kandy once again proved jinxed for the Sri Lankans who lost their third successive Test here after taking a 1-0 lead in the series. It was a spectacular display by the Indians who came into the match after a humiliating defeat in Galle and conceded a 42-run first innings lead. The batting, which had been found wanting on several ocassions earlier on this tour, finally clicked as a unit and showed an urgency and sense of purpose. The partnerships got going and every single batsman contributed healthily to the total. It now remains to be seen whether India emulate England or South Africa when they go into the third Test starting in Colombo on Wednesday. England and South Africa, the previous two countries to tour Sri Lanka earlier this year, had both conceded a 0-1 lead to the hosts at Galle in their three-Test series but equalised at Kandy. While England continued to win the third Test to clinc the series 2-1, South Africa were content to finish with a 1-1 draw. India had a long way to go when they started the fourth day today at 55 for one in their second innings. The key was to hold on to their wickets during the pre-lunch period and the Indians got it perfectly right. Dravid and Ramesh realised the primary task of staying at the wicket and did not go out of the way to score. Runs came slowly but with two days of play left, there never was any shortage of time. Dravid’s concentration and determination personified as he negotiated the likes of Chaminda Vaas and Muthiah Muralitharan with his perfect technique. Ramesh was a bit edgy, his habit of playing away from his body landing him trouble on a few ocassion, but he did well to hang on through the first hour of the morning. He was out to a silly shot for 31 but not before raising 61 vital runs for the second wicket with Dravid. Ramesh presented a horizontal bat to a short and wide delivery from Dilhara Feranando and Sanath Jayasuriya held on to a good catch leaping in the air in the slips. Meanwhile, Dravid was engaged in a very interesting tussle with Muralitharan, the off-spinner trying every trick in his book but unable to break through the defences of the stylish Karnataka batsman. Dravid had hit Muralitharan for six of his first nine fours but the bowler had his moments too. On quite a few ocassions, the ball kept low and rushed into the wicket and Dravid just about managed to get his bat on it. Muralitharan had very nearly got his wicket earlier in the day when the ball turned the other way and hit Dravid’s back pad but umpire Tyronne Wijewardene gave the benefit of doubt to the batsman. Ganguly, who came at the fall of Ramesh, took his time to settle down and looked determined to make a mark here. He did it albeit after receiving two ‘lives’. Dravid raised his 21st fifty and celebrated it with a beautiful pulled boundary off Muralitharan. He continued with his elegant knock, punctuating it with 14 hits to the fence. He looked well set for a century when Muralitharan got back his due and had him caught at silly point by Russel Arnold. Dravid’s 75 came off 123 balls and India lost their third wicket at 194. It was now left for Ganguly, who was looking good by this time having hit a few of his trademark cover-drives, to anchor India to victory. The captain was riding on a wave of luck having been dropped by Muralitharan at point. Ganguly’s slash off Fernando remained in air and Muralitharan dived full length to get a hand to it but failed to hold on. Immediately after the dismissal of Dravid, Ganguly survived some more anxious moments. One particular delivery from Vaas rose sharply and he was not sure whether to hook or duck. The ball went in the air after taking an edge but the fielder at forward short-leg had already gone for evasive action and failed to catch it. But Ganguly overcame these hiccups and got back to playing some fine shots. He brought up his first fifty in 12 Tests and got into a really attacking mode after that. Some blistering cover-driven fours did a world of good to his confidence and he looked in a hurry to finish off things. At 214 for three, Ganguly got another ‘life’ when Arnold dropped him at second slip. 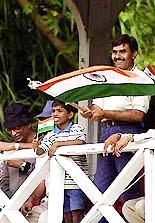 That was probably the last nail in Sri Lankan coffin as Ganguly raced away from that point to reach the target. As India cantered to their victory, the only interest remaining seemed to be whether Ganguly would be able to reach his hundred. The captain himself seemed desperate to get it and went for some wild shots in order to reach there. When on 92, Ganguly hit a four and then ran two to reach 98. With four runs remaining for victory, it was required that Mohammad Kaif, who had given excellent support to his captain after the dismissal of Dravid, play out the next over. Kaif, who remained unbeaten on 19, seemed to be obliging Ganguly when he was unable to score off the first three balls in the next over by Vaas. But the fourth one was a full-toss directed at Kaif’s hips and the batsman just steered it to the fine leg fence. “I am extremely happy with the discipline showed by the team here. We played positive cricket,” Ganguly said after India registered a seven-wicket win to square the three-Test series at 1-1. About his own innings of 98 not out that fetched him the man-of-the-match award, Ganguly said he had been working very hard to come out of his lean patch and the efforts had paid dividends. “I was pretty happy to put a bit of bat on the ball. I had a bit of luck but that happens... I had been practising hard for quite sometime. I tried to play positively... that’s what I did in the first innings and again this time and it worked,” he said. 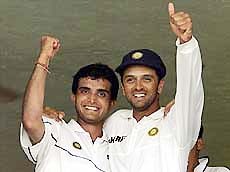 On promoting Dravid and himself up the order, Ganguly said, “We have been trying certain things. It’s all very good when it works well and not when it doesn’t. I am glad we played positively,” he said. Ganguly thanked the groundsmen for preparing a good pitch. “This is the sort of pitch that produces fantastic cricket and brings the crowds to the ground,” he said. Sri Lankan captain Sanath Jayasuriya tried to rubbish the talk of jinx at Kandy and said the losses were a result of the opposition playing better cricket. “Whenever we have lost here, it is because the opposition has played better cricket. In this match too, we didn’t bat properly at all in one of the innings,” he said. “We didn’t capitalise on the 42-run first innings lead,” he said. This was the third successive loss at Kandy for the Sri Lankans and on all three ocassions they negated a 1-0 lead gained in Galle in a three-match series. Mark Ramprakash was unbeaten on 43 and Alec Stewart on one but with just the tailenders to come, England were still 183 short of avoiding the follow-on after Australia had piled up 641 for four declared yesterday. Warne, who had already taken the first three wickets to fall in this innings thought he’d reached the magic figure when, in his second over after lunch, wicketkeeper Adam Gilchrist appealed for a stumping against Usman Afzaal (16) with England 188 for four. South African umpire Rudi Koertzen at square leg called for a replay and it looked as if Afzaal’s back foot was on the line, not behind it in which case he was out. But the pictures were not completely conclusive and third umpire Mervyn Kitchen gave the batsman the benefit of the doubt. Afzaal added insult to Warne’s injury by superbly cover-driving him to the boundary, bringing up a fifty partnership with Ramprakash in 77 balls, England 218 for four after 63 overs. 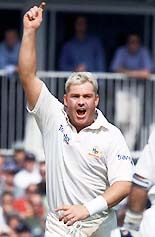 After a post lunch spell of 6-0-27-0 Warne was once more replaced by Mark Waugh. Afzaal, in his third Test, reached his maiden Test fifty with a single off paceman Jason Gillespie. With Australia setting attacking fields, his runs had come in good time, 74 balls faced including eight fours. But four runs after reaching his half century, the 24-year-old Pakistan born Nottinghamshire left-hander top edged a pull off McGrath to Gillespie at fine leg, England 255 for five. Australia (Ist innings): 641-4 decl. Fall of wickets: 1-58, 2-85, 3-104, 4-166, 5-255. Williams had to play twice in a day because rain stopped play on Thursday. Davenport, however, had the luxury of having yesterday off as she moved into her fourth final in the last six tournaments. Davenport did not have to play her semi-final against Belgium’s Kim Clijsters, who withdrew because she had not recovered from a strained right thigh which she suffered during Thursday’s quarter-final victory over France’s Nathalie Tauziat. The busy Williams outlasted the fifth seeded Henin 6-3 5-7 6-2 to move into the semi-final round where she overpowered the second seed Capriati, 6-4 7-6 (7-1). Capriati looked on the positive side after her loss. “I am pretty pleased with the match. Some things I could have done better like serving more bombs on my first serve, but I felt like it was pretty close,” she said. COMMACK: Third-seed Pete Sampras recorded 11 aces and faced no break points to overwhelm unseeded Spanish qualifier Felix Mantilla 7-5 6-3 here yesterday and reach the semifinals of the $400,000 ATP Hardcourt Tournament. Sampras will meet Thomas Johansson of Sweden, the number five seed, who won twice yesterday for the privilege to face the 30-year-old American and holder of a record 13 Grand Slam titles. Johansson routed Frenchman Anthony Dupuis 6-3 6-1 in late second-round match after rain stopped play on Thursday and then returned to dispatch fellow-Swede and Davis Cup team-mate Thomas Enqvist 7-5 3-6 7-6 (9-7). He saved one match point in the final set tie-breaker. The other semi-final will pit fourth-seeded Frenchman Arnaud Clement against Tommy Haas of Germany. Clement, who will be playing his second semifinal of the season, rallied from a set down to overcome Brazilian qualifier Fernando Meligeni 1-6 6-3 6-3. Gerard Houllier’s resurgent premiership outfit shredded the reigning European Champions to pieces thanks to the sheer speed of England international Michael Owen. Owen scored one and set up another while Emile Heskey scored a brilliant individual effort as Liverpool added the Super Cup to the English Charity Shield and last season’s historic treble of League, FA and UEFA Cups. Bayern rallied to come back from 3-0 down to score two second-half consolation goals and finished the game streaming forward but Liverpool hung for a deserved win. “It will be exactly six months today since we started winning trophies — and I can tell you this one gives me as much joy and as much delight as the first,” said delighted Liverpool boss Houllier. “I must congratulate the players for what they have achieved. They have shown the winning edge. We are not perfect yet but we play well together and the spirit is excellent. “The only Super Cup we won before was in 1978 — and half our team was not even born then ... We have a young team and we can be confident for the future. They are learning fast,” Houllier added. The win rounded off a fine week for Liverpool which saw the Merseysiders finally end their 16-year exile from the elite of European football by booking their place in this season’s Champions League first phase. The performances of Liverpool’s rampant international contingent will also have delighted the watching Sven-Goran Eriksson, whose England team play Germany in a crunch World Cup clash in Munich on September 1. The form of Owen in particular will have been music to Eriksson’s ears. The young forward has started the season on fire and his goal in Monaco’s Stade Louis II was his seventh in four matches. “It’s a very special trophy to have won, winning five trophies is a dream, it’s just unbelievable,” man-of-the-match Owen afterwards said adding, “but we don’t want to stop there. There’s more trophies for us to win and we’d like to think we can challenge for them — obviously we’d like to win the premiership and we want to challenge for the Champions League. “I think we showed tonight that we can play at that level,” he added. Liverpool took the lead with a wonderfully worked goal in the 23rd minute. Tenacious England midfielder Steven Gerrard picked the ball up in midfield and clipped a gem of a pass over the top for Owen, whose searing speed took him clear down the right flank. Owen’s firm, low cross was met by Liverpool’s Norwegian summer signing John Arne Riise — a former Monaco favourite — who slid the ball home to the delight of Liverpool’s meagre contingent of fans. Owen ought to have made it 2-0 in the 32nd minute, when an excellent through ball from strike partner Emile Heskey put him through on goal. But a fine save from Bayern skipper Oliver Kahn snuffed out the opportunity to the relief of an increasingly porous German defence. Liverpool’s second finally came on the stroke of half-time with a wonderful solo effort from Heskey. Nothing seemed to be on when the powerfully built striker controlled a ball from Riise near the edge of the area. Cheered on by an excited crowd, Boulami stormed home in seven minutes 55.28 seconds yesterday, beating the old world record of 7:55.72 set by Bernard Barmasai of Kenya in Cologne in August 1997. Boulami threw his arms in the air in triumph as he crossed the line ahead of Kenya’s world and Olympic champion Reuben Kosgei, with whom he had battled it out over the last lap. Kosgei came second in 7:57.29 and fellow Kenyan Stephen Cherono third in 7:58.66. Earlier, Morocco’s Hicham El Guerrouj came within a whisker of beating his world record in the 1,500 metres. The world champion beat off a strong challenge from bernard Lagat of Kenya to win in three minutes 26.12 seconds on a hot and humid night. The time was just outside the world record of 3:26.00 set by El Guerrouj in Rome in 1998. Lagat came second in 3:26.34 and fellow Kenyan William Chirchir third in 3:29.29. El Guerrouj, who missed out on the gold medal at the last two Olympics, had announced earlier this month he was quitting 1,500 metres running after clinching his third consecutive world title in Edmonton. Olympic champion Marion Jones confirmed her dominance by beating newly-crowned world champion Zhanna Pintusevich-Block of Ukraine in the women’s 100 metres. It was jones’s fifth win of the season in the Golden League and means she will share in the jackpot of 50kg of gold, reserved for athletes who win their event five times. Pintusevich-Block pulled off one of the biggest upsets in world championship history by beating Jones in Edmonton earlier this month and the American was out to prove the defeat was a one-off. Jones, who had already beaten Pintusevich-Block in Zurich last week, did so again in Brussels, powering through to win in 10.86 seconds. The Bahamas’ Chandra Sturrup came second in 10.95 while Ekaterini Thanou of Greece came third in 10.96. Pintusevich-Block had to settle for fourth place in 10.99. The Arjuna Awards function, scheduled to be held here on August 29, has been postponed as President K.R. Narayanan is indisposed, official sources said today. The function, to be held at the Ashoka Hall of Rashtrapati Bhawan, will now be held towards the end of September, the sources added. As many as 37 sports personalities (one for Rajiv Gandhi Khel Ratna, 31 for Arjuna and five for Dronacharya) were selected for the awards this year and the selection process ran into a controversy with Milkha Singh, feeling slighted, rejecting the Arjuna Award for lifetime achievement. Milkha Singh’s action triggered allegations and counter-allegations about the selection process. In a keenly contested match, the winners established a slender lead of four points at the breather (36-32). Tall, lanky international Kulwinder, who represented India in the Asian Junior Basketball Championship and also played in the International Netball Championship at Colombo recently was unstoppable. She played a stellar role for Amritsar scoring 44 points while Dimple and Rajbir contributed 13 and 8 points, respectively. For Rest of Punjab, Mala (14 points) was top scorer followed by Aruna Rani and Mukty with 10 points apiece. In the inaugural match, PSEB, Patiala, outplayed Rest of Punjab 57-41 after leading 31-17 at the end of the second quarter. For PSEB the bulk of scoring was done by Ravinder (24), A B Singh (16) and Gurpreet (10). Sanjeev with 17 points led Rest of Punjab’s fightback. Harsimran (6) and Damandeep (5) also played well for the losers. In the second match, hot contenders, junior national champions Punjab Juniors scored a thumping victory over Rail Coach Factory, Kapurthala, 65-39. Pawan and Jasjot with 21 and 17 points, respectively were the main architects of Junior Punjab’s win while Amit Prashar contributed 8 points. For RCF, Sharanjot chipped in with 19 points while Balbir and Surinder scored 6 points each. Holders, Jalandhar eves started their title hunt on a rousing note by registering a comprehensive victory 45-29 over Gurdaspur. Mandeep Khaira (19) and Reena (16) excelled for the winners. Suman (10) and Rajni (9) fought a losing battle for Gurdaspur. In the evening Rest of Punjab rolled over Rail Coach Factory, Kapurthala 61-49. Railmen seemed no match to their opponents as they were found wanting throughout the encounter. The winners were leading 48-27at half-time. For Rest of Punjab, Sanjeev top scored with 15 points. He was ably assisted by Harsimran and Damandeep who netted 14 baskets each while Sandeep made 8 points. For the losers, Sukhdeep Singh stood tall with 10 points. Anjali Vedpathak and Anuja Tere won the gold in air rifle for women with a combined score of 787. Anjali shot 394 while Anuja tallied 393, coach Sunny Thomas told PTI over phone from Munich. The third Indian in the event Meena Kumari, not part of the team but who would be considered for the badge honours for individual performance, also shot a 393. In the free pistol team event for men, Samaresh Jung shot 554 and Ved Prakash tallied 544 to win the second gold of the day for India with a combined tally of 1098. Vivek Singh, in the fray for the badge honours, shot a 553, Thomas said. Meanwhile, Abhinav failed to make it to the medal round of the World Cup finals in Munich. Bindra, the only Indian to feature in the competition of the top 10 shooters in the world, shot a 592 and finished last. The top eight moved into the medal round with the cut-off being 594. Abhinav and Charan Singh had created a new championship record in the air rifle pairs event to strike the first gold for India in the Commonwealth shooting yesterday. In women’s air pistol event in Commonwealth championships today, Sonia Rana and Shilpi Singh shot a combined score of 747 to win the silver. Sonia shot 374 while Shilpi fired 373. Shweta Chaudhary scored 374 in the same event for the badge honours. Mr Devender Singh said Haryana and Punjab were emerging as major centres for the growth of bowling, which is supposed to be the most popular sports event after football the world over. The second ColorPlus National Bowling Championship, starting on September 6, will be held at Amritsar, Agra, Mussorie, Ahmedabad, Hyderabad, Kanpur, Lucknow, Siliguri, Patiala and Jalandhar. He said these venues are in addition to the six regional venues of Delhi, Mumbai, Calcutta, Chennai, Bangalore and Amritsar. Thanks to the involvement of ColorPlus, the championship caries a prize money of Rs 5,60,000. The ColorPlus Championship is the official qualifying event for the AMF World Cup to be held in Pattaya, Thailand from November 4 to 11. Managing Director of ColorPlus Rajendra Mudaliar said the encouraging response they got while sponsoring the National Bowling Championship last year prompted them to renew their association this year too. Mr Rishi Narain of International Management Group said for the first time the championship will have a corporate and rookie section as part of an endeavour to further popularise the sport. Those who will be vying for the first prize of Rs 1 lakh are defending champion Ramesh Rawat, Rajat Grover, Aman Chopra, Harsh Vardhan Sarada, Sandeep Kanojia, Mohan Lal, Arvinder Singh, Aman Sahni, Mandeep Singh and Kannan. A women’s section will be an added attraction of this edition of the championship. The English team will also play three three-day games at Mumbai or Pune, Hyderabad and Jaipur or Jodhpur before the Test series. Brief scores: KV High Grounds 152 in 20 overs. K.V. R.C.F. Hussainpur: 86 all out in 16.2 over. (Anoop Kumar 2 for 4). Winners K.V. High Grounds, Chandigarh, will participate in nationals which will be held at Bangalore from October 13. Earlier, officiating Commanding Officer R.K. Bhattacharjee declared the six-day meet open. In his address, he stressed on the need to display discipline of the highest order. As many as 14 teams of KVS, Chandigarh region, vied for the top honours. The host Principal D.S. Pilkhwal appreciated the healthy contest on the playfield. Vivek Bhandari, who was the sole leader at the end of two previous rounds, played steady golf and returned with another fine essay of four under card of 68 to total 275, an overall 13-under effort. Playing a brilliant game in the under-18 final, 13-year-old Bhat (second seed) upset top seed Nanditha Chandrashekhar from TN 6-1 7-5. Bhat, top seed in the under-14 girls section, defeated Sandri Gangothri (Andhra Pradesh) 7-6 (7-0) 6-0 in the under-14 final. It was a good day for the Panchkula shuttlers who made it to eight finals on the penultimate day of the Haryana State Junior Badminton Championships at Karnal. As per fax message reaching here, Akshit Mahajan reached the under 10 final and will meet Tapan of Sonepat. In under 13 section, Adhiraj Neogi and Gaurav of Jind will clash with each other in the final while Sumit Dahiya of Bhiwani to take on Sachin Garg in the final. The under 13 doubles final will see Rohit and Gaurav of Sonepat will clash with Adhiraj and Prateek of Panchkula while Sachin and Gaurav of Panchkula to clash in under 16 doubles final. In girls under 13 doubles final Kannu Priya and Pallavi Aggarwal of Panchkula will take on Chestha and Dipali of Faridabad. In the girls section, Nadia Saini of Sirsa defeated Steffi of Sirsa to bag the title. Nadia made full use of her serves to gain control over the match. In sub-junior boys (round II) Rohit Verma b Ashish, Ankush b Anil, Deepak Bajaj b Vishoo, Vikash Nandal b Sudhir. Prateek Gupta b Akhil, Satish b Aditya, Aghi. Dev Saini b Yogesh, Naman b Shantanu, Prateek Nagpal b Siddharath, Kuldeep Singh b Puneet, Viney b Ankit Narang, Rahul b Nishant, Rohit Tanwar b Prashant and Divey b Rahul. In the pre-quarter finals, Kuldeep Singh b Naman, Prateek Gupta b Prateek Nagpal, Viney Ivan, Vikas Nandal b Ankush, Rohit b Dev Saini, Rohit Verma b Deepak Bajaj, Sandeep Dangi b Divey and Rahul Tanwar b Satish. In the quarter-finals, Rohit Verma b Vikash Nandal, Kuldeep Singh b Prateek Gupta, Rohit b Sandeep Dangi and Viney b Rahul Tanwar. Speaking on the occasion, Raja Narinder Singh said the government would provide100 units of free electricity to Dalits. He said each village panchayats would give two acres of land to the dalit community. The minister gave Rs 20,000 to the Shaheed Bhagat Singh Youth Club.